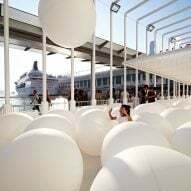 New York-based design studio Snarkitecture has created a surreal interactive playground, filled with hundreds of giant bouncy balls, by the water in Hong Kong's Harbour City shopping district. The giant 1.5 metre-diameter spheres, which are 300 times the size of a regular bouncy ball, have a similar feel to beach balls – but are made from a slightly softer material. 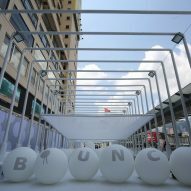 Snarkitecture created the installation, called Bounce, to investigate the boundaries between art and architecture. 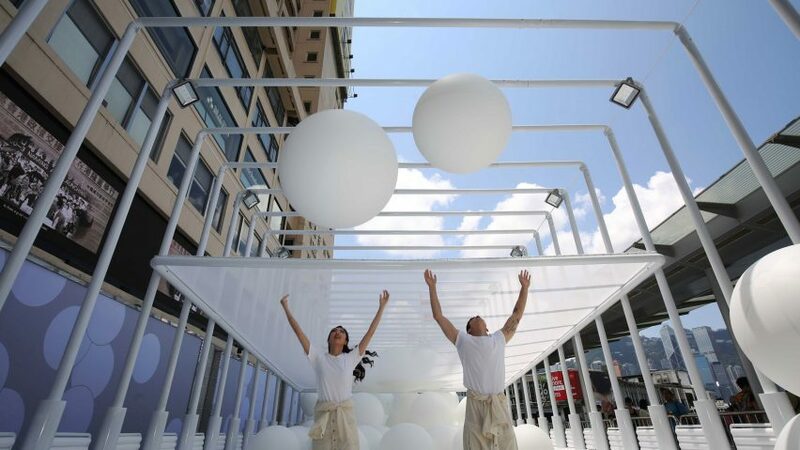 The team focused on balls for their latest work because the sphere is not a shape commonly found in architecture. "It's a form you don't typically see. 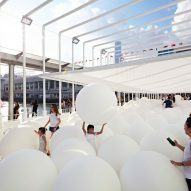 Spheres are also a direct signifier of play – visitors know they are invited to play inside Bounce," said Olivia Colson, studio director of Snarkitecture. 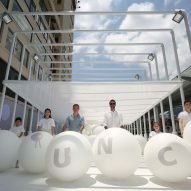 Participants at the outdoor installation are invited to roll, toss or bounce the balls. 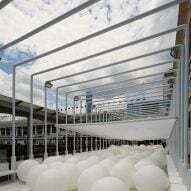 The structure itself is a cage structure created from a series of white steel frames set apart at a width through which the balls can't escape. 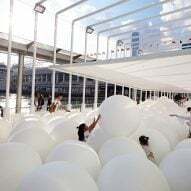 "Although they are free-floating objects, the quantity of spheres creates a landscape with depth, which visitors have to wade through to get to the other end of the installation," Colson continued. 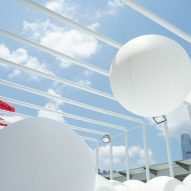 Visitors can throw the balls onto a translucent mesh raised above their heads to create a field of moving silhouettes as the spheres roll towards the middle of the mesh and float back to the ground through a hole at its centre. The installation was built locally off-site, and tested, before being dismantled and reassembled at Harbour City. "The use of white is largely about reduction or simplification. Visitors are more aware of their surroundings and overall experience if they aren't distracted by an abundance of colour or texture," said Colson. "When people enter an environment that focuses on a single palette, material or gesture, although that space might reference familiar elements, it’s a complete transformation from everyday life," she continued. The studio hope that the visitors themselves will provide the colour to bring the installation to life. "The use of white is largely about reduction or simplification. Visitors are more aware of their surroundings and overall experience if they aren't distracted by an abundance of colour or texture," said Colson. "When people enter an environment that focuses on a single palette, material or gesture, although that space might reference familiar elements, it’s a complete transformation from everyday life," she continued. The studio hope that the visitors themselves will provide the colour to bring the installation to life. 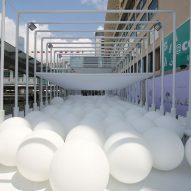 Snarkitecture's outdoor installation accompanies an indoor exhibition at Gallery by the Harbour nearby, of white and silver spheres that fill up the gallery space. Both the gallery and Snarkitecture installations opened on 10 August 2018, and are on view until 2 September. Snarkitecture is currently celebrating ten years of projects with an exhibition at the National Building Museum in Washington DC, which runs until 3 September 2018, and includes a kidney-shaped pool filled with thousands of plastic balls.